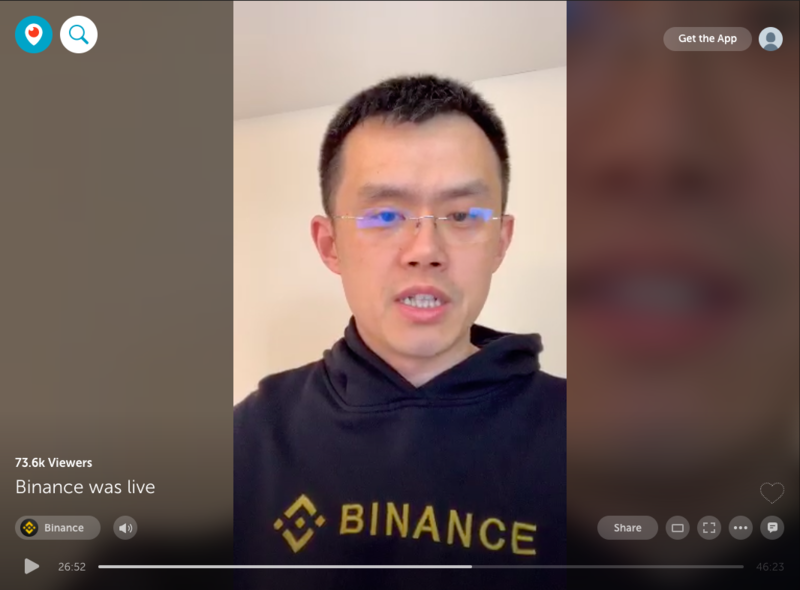 Binance CEO Changpeng Zhao (CZ) held a 45-minute live AMA (ask-me-anything) to talk about our upcoming Binance Chain, plus more topics. Click this link or the picture below to watch the full video. Special thanks to the thousands of engaged viewers of CZ’s first-ever AMA, especially those who asked their questions. 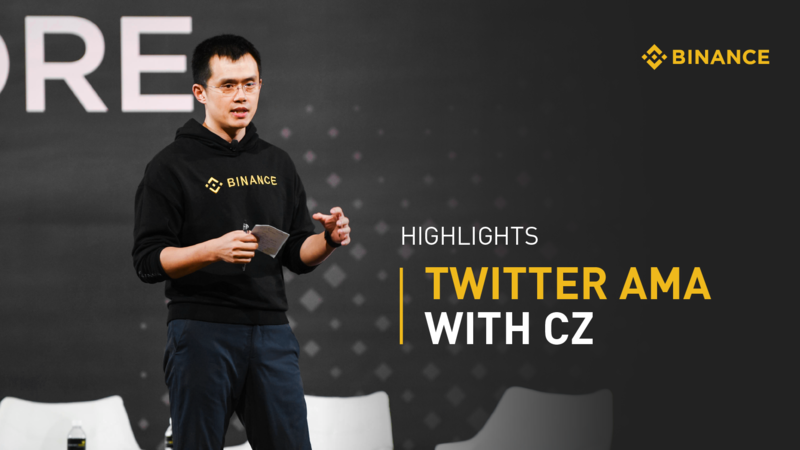 CZ responded to 73 questions during the 45-minute session, and we’re looking forward to making this an ongoing series, where we’ll address more of your questions with each AMA. Stay tuned. CZ: Hello guys, this is CZ from Binance. This is actually my first time using a live stream. So I see a couple of guys joined. Okay, looks like it’s working. Let me just check very quickly. I’m going to jump straight into those questions. It is actually the first time doing a live-streaming. I said I was going to do a live stream about a year ago, so I’m happy to be able to finally deliver. My team has already done the hard work of organizing some of the questions for me, so I’ll just go straight into it. If you have any questions, after I go through these questions, I can try to answer some of the ones on the live stream. For the testnet, right now we elected to run 11 test nodes. I think any number is fine, the number of validators in our network will be small, mainly for performance reasons. So it will not be as big as a bitcoin network with thousands of nodes. It’s going to be more like NEO or even Ripple. A smaller number of nodes, and each node will be rather large. You can run a node yourself. I’m not sure if this is a business requirement or a technical requirement. Technically, you can run a node yourself. You do need a relatively heavy machine, I don’t know what exactly the specs are. That depends a little bit on trading volume and traffic. We generate one block every second, which is going to require a large disk. Right now, all of the gas and fees collected by the node are kept by the node. Right now we’re just launching Binance Chain with a very simple business model. Our main goal is to get the Binance DEX up and running as quickly as possible. My philosophy is always, Get the thing working, make sure everybody uses it, then adjust the business model. Initially, all of them will go to the nodes. Very soon, in probably about a week or so -- last time I said two weeks, about four weeks ago -- but very soon, we will open the Binance Chain beta-testing to the public. So, very soon. I don’t think you have to apply anymore. We have given a few of our selected partners access to our DEX. Most of them are the wallet developers or blockchain explorers, basically guys who have some tool that we are integrating with. So we went earlier with those guys, because we need those guys to develop and support us. But very soon we will open the beta, in about a week or so, I would guess. But again, don’t quote me on that. There will be a listing fee on the DEX. I actually deliberately want to set that a little bit high, just so we reduce the number of spam or scam projects. And there’s also a voting process by the validators to be listed on the DEX. So there’s a fee, I think the fee will be probably close to $100K US, so we’ll see. But the fee is adjustable over time, it’s quite easy to change. Yes, for sure. The Ledger Nano S will support Binance Chain and you can store the native Binance Coin on the Ledger Nano S.
This is a pretty simple thing. If you use a hardware wallet and connect with the Binance Chain, you know that your private keys never leave your device. And we have multiple other ways to prove that even from other devices, or other clients, your private keys never leave your device. So from that perspective, it is decentralized. You’re guaranteed to know that you’re the only one holding your private keys. We haven’t really decided on interchain operability. 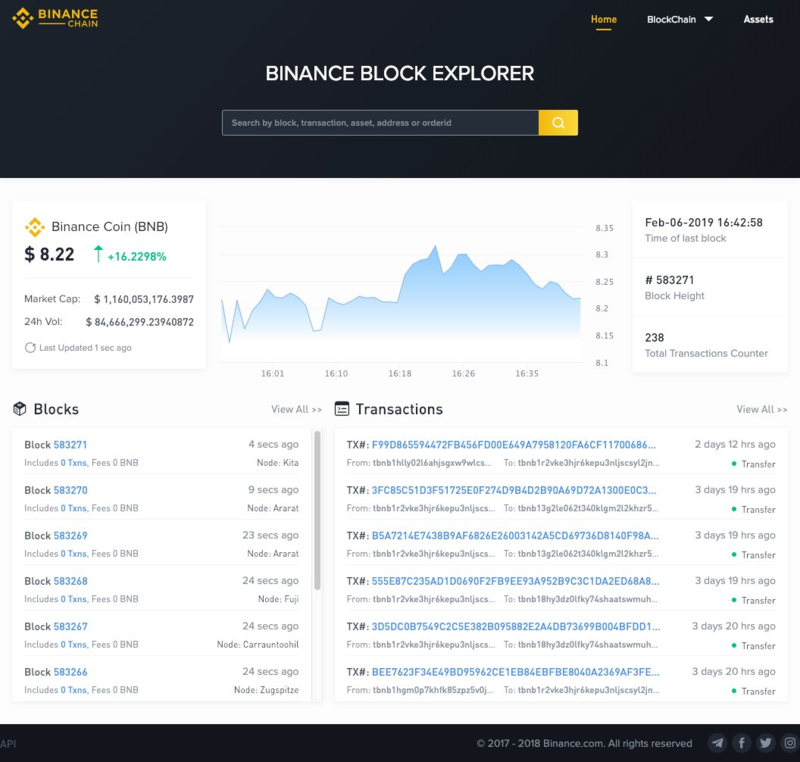 Initially, in the first version, we’re just going to focus Binance DEX to run a decentralized exchange by itself first. So we will worry about interchain, cross-chain features later. That’s probably in version two or version three. Because we are using a version of Cosmos and Tendermint, if they have those features, those are the most natural things for us to learn from. The DEX will be available on all platforms. In most platforms, you will be able to access either the DEX or the client UI via a web browser. In terms of our hardware wallets, we have already integrated with Ledger Nano S and we’re working on the Ledger Nano X version as well. I think the Trezor and KeepKey versions will come a little bit later because those are a little bit more work to integrate. Hopefully, we will be able to support all the hardware wallets as soon as possible. I think I answered this question before. Right now, the nodes get all the rewards for processing the transactions. We don’t have a fixed structure of fees for nodes or whatever yet. We’ll figure that out later. So the consensus algorithm eventually will be DPoS in the future. So it will be DPoS plus Tendermint’s pBFT, it’s a variant to that, very similar to Cosmos. Please check with our Tech Doc. It's hosted in the same place as the FAQ. I think the integration documents are pretty clear already. So if you look at that, it should be pretty clear. So the DEX doesn't really support OTC. OTC by its meaning is off the chain, or over the counter. But Binance does have an OTC desk if you want to use that. Also, regarding private transactions - right now, Binance DEX works very similar to Bitcoin. So most transactions are transparent. There's no hidden transactions or private transactions. I think that's most of the questions collected on the DEX. So I'm going to go into some of the more general questions from Twitter. 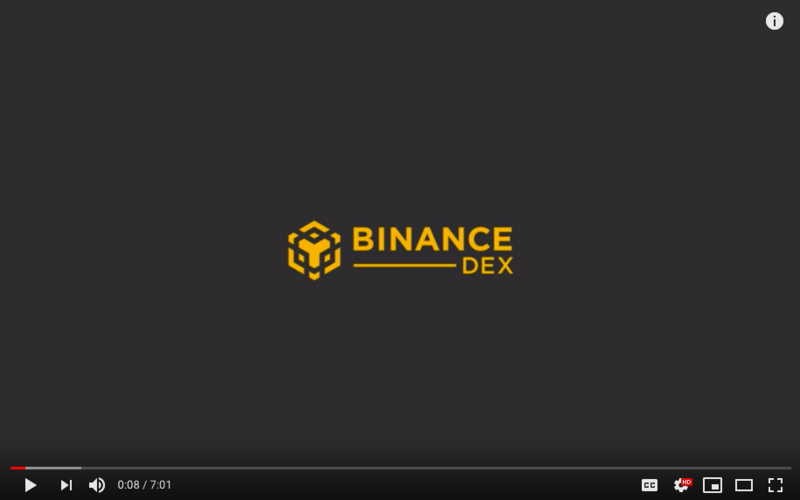 Click the image below to watch our latest sneak peek of the Binance DEX. I think basically Binance is ready to survive any number of years, no matter if it's bear or bull. I think we basically don't really look at the market too much, not as much as people actually think we do. We just keep our head down and build features. Binance is very healthy financially and also very stable in terms of the team. So I think our aim is much longer than another year. Our aim is 10, 50, 100 years. So we'll be here for a while. Yes, absolutely. We definitely want to bring crypto or fiat pairs to more countries in Africa and around the world and we are working on that. We have a small team. So we have limited capacity. We're working through the countries one by one. So we'll see how that goes. Yes, so we are still working on a lot of new features for Binance.com. A lot of features are missing. Once you have a product running, it’s never done. OCO is a feature that's requested very heavily from many of our users. We are working on that and we want to support OCOs natively in the engine in the matching engine. So it's almost guaranteed OCOs. It's going to take a little bit more time to implement, but our guys are working on it. The same thing for trailing stops and visible orders on the chart. All of those features we are aware of, but it just takes time. So please bear with us. We're working on them. Once I learned about crypto and how Bitcoin works, I just understood that's the future. I think it's the freedom that crypto offers that really attracted me. I'm a guy who's lived in multiple countries around the world, even at a very young age. So the concept of a country or a border is more virtual to me. And when you're traveling between different countries, you know the difficulties with traditional fiat currency. Like for example, if I have my money in one country and I moved to a different country and try to pay, it’s really awkward. The system doesn’t work very well. So, that's how I got into crypto. I think for Binance, our achievements and success so far are just - I hope - at the beginning, so I don't view Binance as hugely successful. I think as an industry and as a company or as a team, we're still very small and we’re still very young. So there's still a lot of work to do. For other upcoming crypto entrepreneurs, I would say just, look, there's a lot of random noise in the crypto industry and outside of the crypto industry about us. The best advice I can give is basically, keep your head down, figure out your strength, and use your strength to build a product that other people will use. So yes, absolutely. In the future, we do plan to allow margin trading, but it may take a little while. I think our focus is getting the DEX up and running first. Actually, what's interesting is there's a new trend where people are actually doing a margin using smart contracts. So this way, it's actually more transparent than traditional margin trading on centralized exchanges. So that's also coming, we're looking at that as well. So that's that's pretty interesting as well. But all those other features we do plan to add to Binance.com. Ah. Okay, that's an interesting question. Let me brag a little bit about that. I have some corky theories behind it. I think for me personally, if you give me twice as much money, or if you take away half of my money, the real impact is marginal. It makes very little difference. I did do some thinking to figure out why do we want to do the things we want to do. I think, as human beings, we are genetically engineered to take care of ourselves first, and then help others. Because as a species, if we don't do that, then our species is probably not going to last very long, or probably will not exist. I think at this stage, I can take care of myself on most fronts relatively well, and then I just want to do something that's meaningful and that's impactful. And the most meaningful thing is to be able to help some other people. If I have stronger abilities, I can help more people. If I don't, then I just help a smaller number of people or help them a little bit less, or I'll just help them a little bit. But I think that's the goal in life, is just to help people. And I think the thing that I can make the most impact on is to bring the crypto to the masses, to help adoption of cryptocurrency and to increase the freedom of money around the world. Yes, I think funds are quite SAFU. We use multiple layers of security at Binance, it is quite hard to penetrate all layers at the same time. And we have traps in the earlier layers, that if you trigger something, we actually will be able to know. That's a longer topic I will not get into right now. We want Binance to be the infrastructure builders, so we won't Binance to either build infrastructure ourselves or invest in other projects that build infrastructure. We want to be the guys building the roads if you use the physical world as an analogy. We want to be the guys building the road so that other people can build buildings in the city. In terms of infrastructure, what does that mean? That means exchanges, wallets, faster blockchains, more decentralized exchanges. Anything that has to do with core infrastructure, we want to build. 31. Binance X Rapid partners? Again, we're focused on launching more features right now. We are working with a number of other partners. But X Rapid, there's nothing going on right now, but in the future, we definitely want to add them as a partner. Okay, this is scrolling a bit too fast. Lots of similar questions. DEX is going to come out in a couple of weeks, for the testnet. We do have a very close relationship with Crypto.com and they already support Binance Coin in their ecosystem. We are always looking for more closer work relationships. 34. Why is Ukraine forbidden to take part in ICO by Launchpad? Whenever a country is blocked from a feature that we offer, it’s usually not our decision. So we never really want to block anybody, but sometimes we don't get to decide. There are other forces that decide for us. 35. Will Binance build physical cold storage banks with ATM withdrawals? No, I don't think we have that on the plan. Well, we locked a few of those Cryptopia stolen funds. So that's that. 37. Can I buy a Binance hoodie? Actually, we will have a guy who will be able to sell Binance hoodies on a small website very soon. So hopefully we can offer that. 38. Do you believe Amazon will have their own stablecoin and crypto exchange? I think again, anything is possible. I tweeted about the fact that Amazon will have to issue a currency sooner or later. But that's just one of my guess. I'm not talking to anybody at Amazon, I don't know anything inside Amazon. So that's that. For any listings, the only place is the listing form. So if you Google ‘Binance Listing Tips,’ you're going to see an article I posted on LinkedIn. I think that explains all the things about listing. 40. What's your relationship with Justin Sun? 41. What is the supply of Fetch? Actually, I don't have the total supply on top of my head. If you look at Binance Research, we issued a report with all the details. So that's probably the best place to look at that. Let me scroll to the bottom get a new question. 42. Are you going to list anything new soon? Yes, so we are constantly reviewing listing applications. I think that was an earlier question by somebody else saying, what is our decision criteria for listing. Basically, we want to look for good projects. Every project is a little bit different and if you want to look for simple criterias, I'll give two tips. The more people who use your product, the better. So if you have a lot of users using your product already, then you have utility value. That's quite easy. But if you're pre-product, ‘before you launch a product’ stage; if you are just at the white paper stage, then that’s a lot harder for us to evaluate. We do evaluate very strictly. The other tip I would give is, I would recommend re-submitting the application every 2-4 weeks. So every month or so. And also update your project’s information on Binance Info. If you show steady progress over time, that's a very good way for us to know that you are actively working on a project. So those are the two tips I would give. We're not in a plan to offer a Binance credit or debit card just yet. We're working with other third-party partners to enable those. So yeah, we're looking for partners too, in those areas. 44. What do you think about the QuadrigaCX exit scam? I don't really want to comment on other exchanges. But there's something fishy going on. I’ll just say that much. 45. Are you looking to fiat withdrawals also back to Visa and MasterCard? I don't know of an easy way to do that, to be honest. So right now, no; in the future, there’s a number of solutions that offer you to spend your crypto directly from a credit or debit card. So there are already a number of solutions that work in a number of countries. That probably works like a withdrawal. where you just spend your crypto directly. We are working with a number of partners in those areas. 46. When will Binance open an office in the US? Right now, there's a lot of countries we’re targeting, and hopefully, sooner or later, we'll have some presence in North America. 47. How can we work for Binance from Canada? I think the Binance teams are spread out all around the world. So we actually don't care too much where people are working from, as long as they pay their own taxes and they don't get into trouble locally. Other than that, we don't really care too much. Launchpad is pretty simple. It’s basically an exchange, an initial sales platform where we help projects to raise money. I do think Launchpad will play a fairly important role in the industry. Because right now, I think most people don't like ICOs too much, because there are too many scams and too many fraud activities. But I think there's a lot of projects and teams in the industry who are now vetting projects and analyzing projects, and we want Binance Launchpad to be a platform where we bring good projects to our users so that we do the due diligence. And we select good projects. 49. What was your first-ever crypto trade? I actually don't trade crypto very much. I bought crypto in mid-2013. Maybe late 2013, but it was like an OTC trade where I bought from a friend, so I actually don't trade very much. Bitcoin ETF is another basket trading product. If it’s listed on a big traditional exchange, like CBOT or CME, that does bring a lot of attention for people outside of our industry to trade on them. But, I don't think ETFs are very core to our industry growth. With or without them, our industry will grow. I actually think that for the industry to grow, we need more entrepreneurs to build real projects. So I think that's the key. 51. Could you introduce chat function inside Binance? We are actually thinking about that, but chatting is a large feature. So we have to see. 52. What's the noise in the background? There's a lawnmower somewhere out there in the background. So I apologize if you guys can hear the noise, but I can't really stop it. It stopped. Okay. Well, careful what you wish for. 53. I invest in cryptocurrency and I would like to design merchandise products for Binance. So, there's a lot of demand for our merchandise, but at the end of the day, Binance is not a merchandise shop. So we're not like Under Armour or those guys. We don't have the infrastructure or even the bandwidth to deal with shipping merchandise. 54. Will you tokenize stocks pairs with crypto? Do you think this is the future of exchanges? I think tokenizing stocks for crypto involves a lot of regulatory exploration. That's probably not our strength. I think a number of other people are doing that. I do think it is a big market, and STOs, security tokens, etc. -- there’s a few questions about that -- so, I think that's a big market once people figure out what exactly we, as an industry, can or cannot do in the security token space. And again, the different regulations vary by different countries, so you have to figure out what you can or cannot do in each different country. I think there's a bigger market just tokenizing everything, so anything can be tokenized and I think that's a bigger market. We'll see how this industry will develop. I'm just scrolling through a number of questions to the bottom every time. Then when I see a question, I just answer them. I think I'm gonna go about 10 more minutes. 55. In one corner, you have Vitalik, and in the other corner, you have Justin. Five years from now, who you got? I think the same guys who are in the crypto space will still be here. In five years from now, there will just be a lot more people, and I think a lot of heavy players are going to move into this industry. I think you guys saw, Jack of Twitter is now actively engaging with the Crypto Twitter community, and he obviously has already bought Bitcoin. So that's a good thing. And he's very public about it. And Stripes supports buying crypto. So that's also a very good thing. So, I think we're going to see more and more people join. On decentralization, most people view that as a binary thing, like is it the decentralized or not. But the reality is that decentralization is a gradient scale. So there's a degree of decentralization that you can achieve, and some blockchains are more decentralized, while some blockchains are more centralized. For any blockchain that has a clear development leader or team, they are more or less centralized in some way. So Binance Chain is going to be a little bit more centralized initially in that way. Hopefully over time, what I say and what our teams say will no longer matter, and we'll have a community behind it. I don't know. I think any number of things can trigger bull runs. We already added XRP as a quote currency. So in the future, we will we will look at more pairs, but we want to make sure that every pair we had have decent liquidity. So we got to be careful that we don't over-add the number of pairs. So many exchanges have a large number of pairs, but it is actually not user-friendly because you have to discover liquidity at different places at different trading symbols, and that's not very good. 60. Any plans on adding Dogecoin? I actually don't think Dogecoin have applied for listing. Dogecoin is one of those coins where I don't see a lot of active development. I normally don't comment on coins but Dogecoin is one of those funny ones. 61. Do you have an estimate on DEX? The testnet is going to be out in a week or so. 62. Will there be a transcript from this chat? I'm not sure. I think this chat will be viewable even afterwards. 63. Does the US-China treaty affect blockchain and crypto? That's a tough one. I don't think it does. I don't think it says anything in there about it. I'm not a politician so I don't really know all the details of that. 64. What is your opinion on the IMF utilizing a cryptocurrency? I think anybody utilizing cryptocurrencies is good for our industry so that's good. There's a lot of guys who inspire me. I read a lot of books. I read a lot of biographies on other people. It’s too long a list of names. I don't want to just randomly pick three and be understood the wrong way. 67. Any insight on where you stand with US? So we want to be fully compliant in every country. Many people misunderstand Binance; we’re actually the most compliant exchange in terms of [the number of] countries with approvals. So I think somebody did research recently. We actually have more countries approving of Binance, but many of those countries are smaller. But we are a fully-compliant exchange. 68. For privacy coins, our EOS project wants to airdrop tokens to Binance EOS holders from the Genesis block. Who do we contact? So that's actually not possible. We don't have a fixed office. Our team’s spread out into many different countries, and we also do not disclose our office address. So we have we have a couple of small-type offices, but for security reasons, we actually do not disclose addresses. 70. Do you think Binance will be the leading exchange, or are decentralized exchanges more likely to lead? Actually that question came up a few times before. Basically I think I adopted this philosophy that we want to disrupt ourselves and not let other people -- not wait for other people -- to disrupt us. So that's why we’re offering Binance.com as the centralized exchange, which is probably one of the bigger ones in the world right now. And then we are also offering the decentralized exchange Binance Dex. We're going to let the market decide. So in the ideal world, we want to be a leading position in both places, and eventually, I personally think those two tools are platforms are geared towards different users at least for now. So as time goes on, we will continue to improve both products and we always let the market decide. We just give options. Binance.com is blockchain token agnostic. We want to add all the good projects that we can find, so we will support multiple blockchains, multiple tokens, etc. That's a fairly broad question. There are a lot of differences. Binance.com is centralized. We hold custody of the users' funds. The platform will be faster and easier to use but then the users rely on our security to hold their coins secure. I think Trust Wallet is working with a number of hardware wallet options, so that will come very soon as well. Regarding Trust Wallet and Binance integration plans, Trust Wallet will support Binance Dex from day one, so most of the development work has already been done. Okay, I think that's most of the questions to be honest, and it's just over 45 minutes. I do have something else later in about 15 minutes that I need to prepare a little bit for, so I think I'll wrap it up over here. Thank you for watching and I hope to do this more regularly now that I know how the technology works. Alright, thank you, guys! See you next time. Bye-bye! Follow CZ, one of the most insightful influencers in the crypto world, on Twitter. Also, follow Binance on Twitter to get the latest updates on our exchange and the rest of the ecosystem. Finally, if you have further questions about Binance Chain, know more about it on the Binance Chain Github repository.